So, this week Samara and I decided to do a call together but not record it. The primary reason for not recording the call was that most of the stuff was review and we were primarily on Samara's site tweaking things and we are not ready to reveal her domain quite yet. Overall, it was good to take a “breather” week and just review some of the things we had talked about, give Samara a chance to catch up on things, and answer some basic WordPress questions. To be honest, sometimes I forget how hard it is to set up a site on WordPress and get your theme, sidebar, menus, links, and everything to look the way you want it. These “little things” have been pretty time consuming for Samara this week. Even though she has been using Thrive Themes, which is a huge time saver in itself, there is still a learning curve when it comes to using WordPress and setting up everything exactly how you want it. So, even though we don't have anything ground breaking to report, I think it is important to share that Samara is busy at work…and this is totally normal! So, if you find that it takes you a few weeks wrestling with WordPress and your themes, just know that you are not alone. It takes some time…but once its done, its done for a REALLY long time (in some cases forever). Last week we did something a bit different: I had a private call with Spencer just to go over lots of little things that are specific to my site. We covered a wide range of topics though, so I definitely want to share what we discussed. First we spoke about my homework assignments from the previous week, which included brainstorming things I can sell to my niche. I came up with a few ideas of physical and information products, and even an idea of a service I could maybe sell (pending additional research), and I will be thinking about other potential items as I continue to build my site out. As I said before, the prospect of having my own product is very exciting, and as Spencer says, that’s the most profitable way to monetize. Other assignments included adding affiliate links to my existing content (which I am in the process of doing), signing up for an email provider (I went with MailChimp, as per Spencer’s recommendation), and getting an opt-in form on my site. I used Thrive Leads to create a very simple opt-in, and the process was relatively straightforward. However, I think that as my site continues to take shape, I will look into creating a more complex form to better segment subscribers. We also spoke about outsourcing. I would really love to write all of the content for my site, but at the same time I’m eager (or, more accurately, moderately hysterical) to get it up and running already. With that in mind, Spencer told me I could spend part of the budget to outsource, which I did on Upwork. I’ve received about half of the articles I sent out, and I have to say they are pretty mediocre. They absolutely need to be spruced up; however, it does feel like progress as now I have more content to work with. I’ve also been trying to sort out my logo. I organized a contest on Freelancer.com where designers could submit their ideas, but that was mildly disastrous, so I cancelled it and hired someone directly. In the end he created a logo which I absolutely love, so that had a happy ending. Anyway, on my site we looked at what plugins I might need and we discussed shortening permalinks, organizing the menus on the homepage, setting up Google Analytics, submitting a sitemap, creating a landing page, and designing my own images in Canva. All in all it was a super useful call as Spencer was able to guide me and give me some advice about setting up my niche site. It’s finally starting to look like something and it feels good great ridiculously awesome! I can’t wait to move on to the next step: linkbuilding! Sounds like things are moving along nicely! Good luck when you finally open things up! One question I have is about outsourcing. Samara says that Upwork provided mediocre posts that will likely need touching up. Is Upwork the recommendation for outsourcing? Did Samara feel she got her money worth or not? Has anyone had better experience with IWriter or Textbroker or etc.? Honestly, you can go to Upwork, iWriter, Textbroker, and other plances and find similar quality on each. It all comes down to the individual author you find. 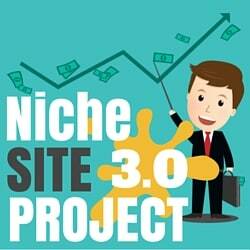 I have to say I’m addicted to Niche Site Project 3.0 – it’s the first one I’ve followed from the start and I’ve found it really inspiring and informative for my own niche site / SEO efforts. Samara – persist with WordPress (I know you don’t really have a choice heh), it just takes time to remember where to go when you want to change something, for me I would always forget about widgets when there was a setting I couldn’t find! Now it’s a breeze 🙂 Content builders definitely make things easier though. Really looking forward to find out out more about all the NSP3.0 sites. Thanks to Spencer, Ryan and Perrin too! Awesome…thanks Oliver for the kind words…glad you are enjoying the project! hi spencer, i have to say i am totally addicted to nichepursuits. i have followed this site from NSP1 and now i am enjoying Nsp3, keep up the good work bro. A great post, because it confirmed for me that I am also on the right track Samara and Im not too far behind you! It can get very daunting, and sometimes the smallest tasks can take a lot of time. Im also itching to get more content out there but from hearing of others’ experiences with outsourcing content, I think for now Im happy doing it myself (as I love writing anyway). All the best, keep up the great work. Im enjoying following your progress! There are so many little things to think about when getting a site up and running- it really can be daunting and overwhelming. I can relate to the feeling of urgency when you just want to get your content out there, but have to resort to outsourcing instead. Sometimes those Freelancing sites can really produce low-quality work, or work that isn’t what you expected. There are great Freelancers out there; it just takes time and effort to find them. Oops didn’t read the first line ,sorry! hi Spencer, can you tell us which plugins to use. I’ll have to dive into this on a future post. Awesome info as usual! Love it! Just if I may say suggest something. The things you covered on this call were very important and these are the ‘little’ stuff that I think most people eventually struggle the most with. Good point. Although, everything covered is not critical to a sites success. Figuring out how to use wordpress menus, resizing text, and similar things aren’t what make or break a site…they are just time consuming when you first get started. I like following up on your progress and am so excited for you! 1. Why was the content you arranged for a logo disastrous? Do you mind sharing? I personally hired someone from Fiverr that I’ve seen his work were ok. He charged $40 for the logo and it was horrible and not useable. The idea of a content seems nice, like 99designs.com but I couldn’t afford their price tag at this time. 2. With Upwork what time of writers did you find. I used TextBroker and hired two writers, one with 4 stars and one with 5 stars, to write a single article. It was expensive! And the 4 star writers supressed the 5 star one. Thanks to you and the entire NSP3 team for all your great work. It would be great to know what plugins you use on your sites, for example to set up a sitemap, Google Analytics etc. I would also find it helpful if you could elaborate on onpage SEO requirements. Looks like youtube video disappear ? There was no video call posted on youtube. I love the realism here. Too many make money online gurus make it sound like all you need is their suggested product (by clicking their affiliate link of course) and you’re up and generating “passive income”. I’m glad samara is telling like it really is. I can relate to spending days making the tiniest CSS changes to a WordPress site.